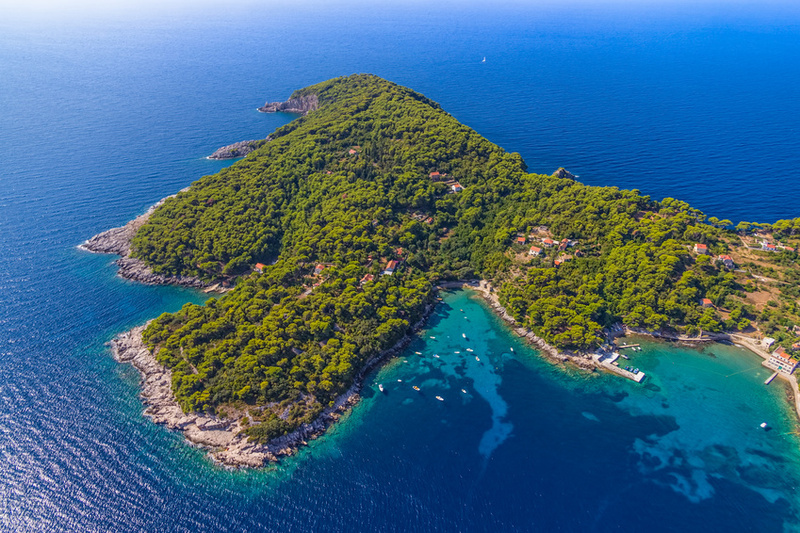 Of the three main Elafiti islands, Kolocep is the closest to Dubrovnik and the mainland. The two main villages on the island are Gornje (Upper) Celo and Donje (Lower) Celo. The island is also the smallest, and has a population of around 300 people. Once called Calaphodia, Kolocep came under the control of the Republic of Ragusa (Dubrovnik) in the 11th century. During this time, the island was an important element of the republic due to its shipbuilding. There are daily ferries, run by Jadrolinija, to the island of Kolocep; journey time is 35 minutes. You could also enquire locally in Dubrovnik about getting a water taxi to the island. As the smallest of the islands, Kolocep must be considered as providing the ultimate in tranquility! Car-free (of course), it’s a great place for relaxation and taking leisurely walks on the paths that criss-cross the island through its pine forests, before retiring for a few hours on one of the island’s sandy beaches. Keen swimmers will delight in the island’s crystal clear waters, exploring the coves and sandy bays that have arisen due to the indented nature of the island. The Blue Cave on the island can be explored by swimming to and in it. There are also a number of interesting churches on the island, some of which stem from as back as the 9th century. These include the Church of St Sergius, with the Church of St Nicholas and the Church of the Holy Trinity from the 11th and 12th centuries. Given its size compared to the other Elafiti islands, it may come as no surprise to learn that accommodation on the island of Kolocep is somewhat limited. But don’t worry – there still are a few options if you wanted to enjoy the peacefulness of the island. The main hotel on the island is the 3-star Hotel Villas Kolocep. Some private accommodation options are also available.